Create your own Music! The most advanced and easy to use Video to MP3 Audio converter. It supports a large number of video file types like MP4, 3GP, WMV etc. 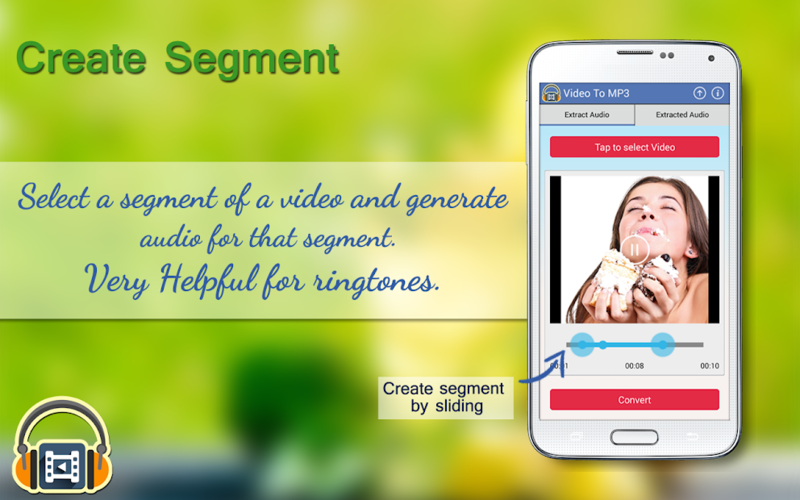 You can also extract audio from a part of a Video and use it for setting as a Ringtone. + Supports a variety of Video media formats like mp4, 3gp, wmv, flv, avi, mkv, mpeg4, mts etc. Supports variety of codecs. + Supports creation of segments with slider based option of selecting start position & end position. You can select a part of a Video and then initiate the conversion process. It is like an mp3 cutter for cutting your videos and converting to an audio for your ringtones. + Easy selection of Videos based on Folders. This makes selection of Videos very easy. Auto scans the entire device for the available videos. + Easy access to generated MP3 audio library - Listen to the generated MP3 Audio with Audio player. Integration of inbuilt audio player with backward, forward, play/pause control. Also supports Audio playing in the background with Notification support. + Watch, play your videos before initiating the conversion to mp3 audio. Inbuilt Video player supported. + Supports conversion of large Video media files. 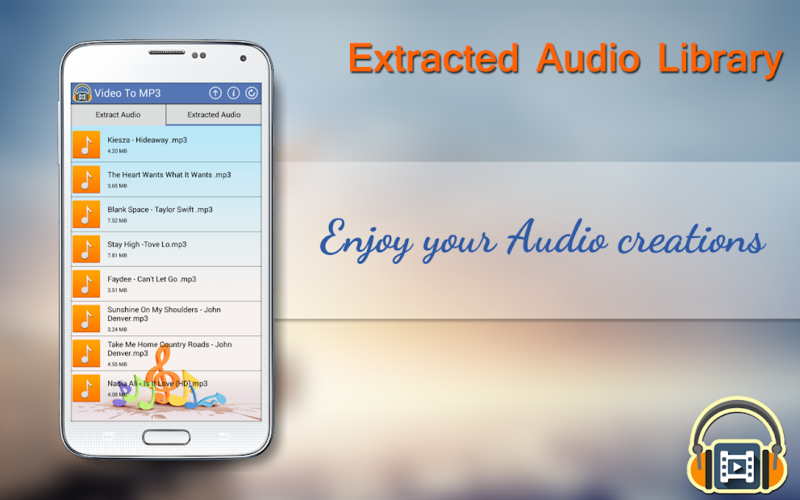 You can even extract mp3 music audio from a complete movie video quickly! Supports music conversion of files either created through the camera, videos downloaded from the web having different bitrate, whatsapp etc. + Supports options of playing mp3 music, renaming, deleting of extracted audios. + Preserves the file name of the video in extracted audio, for eg, if the video file name has Artist, Album, Song title, the same will be preserved in the generated file. Get Video to MP3 Converter Android application for FREE! Video to MP3 converter on Android is the best converter on Android. Video to MP3 converter for Android can convert a large number of video formats types like mp4, wmv, avi, mkv, flv, mpeg4, 3gp, mts etc. Supports variety of codecs. Enjoy and share the MP3 music creator app with your friends on Whatsapp, Facebook, Instagram and more!.